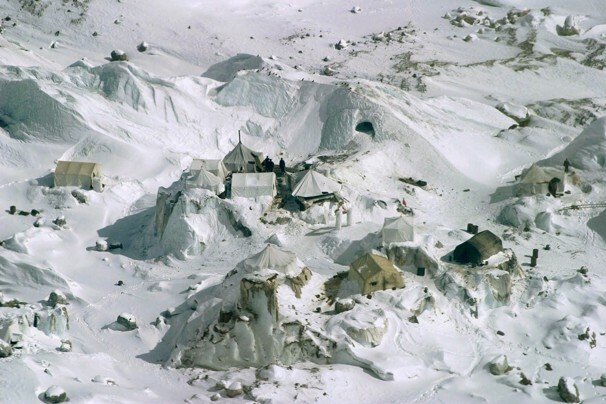 In a shocking development, Indian troops are found to have been drilling in the Siachen Glacier with the purpose of the geothermal exploration owing to which the glaciers, which are water tanks for Pakistan, are fast receding. The geothermal exploration activities are meant to provide the sustained energy supply to the Indian troops which are at war with Pakistan. According to undeniable evidence available with The News, Research Laboratory was set up at an altitude of 11,500 feet from sea level with its field stations at Ranbirpura (11,900 ft) in a joint venture of Siachen Brigade of Indian Army and Defence Research and Development Organization (DRDO). Four Engineers Corps of Indian Army had drilled holes thousands of meters to explore and develop geothermal energy. However, they have been able to explore hot water springs. Thus the deep holes certainly touched the earth’s crust. “The exploration team also reported the sharp vertical and horizontal retreat of glacier, substantiating the claim that the glacier is melting at an unprecedented rate,” reveal the documents. It may not be out of place to mention here that Nimoo-Bazgo hydropower project being built by India on Indus River also means to provide the sustained supply of electricity to Indian troops. Syed Jamaat Ali Shah, former commissioner of Pakistan Commission of Indus Water has also been charged in the inquiry report carried out by Wapda secretary Imtiaz Tajwar for not visiting the site of the Nimoo-Bazgo project and providing the ample time to Indian side for completing the project. Meanwhile, Arshad H Abbasi, an eminent water expert in his letter written to President Asif Ali Zaradri who is also the Supreme Commander of the Armed Forces drew his attention to the fact that Siachen glacier is melting at an unprecedented rate. “It was highlighted time and again that military action, not global warming is the reason for melting of Pakistan’s water tank,” says the letter. The high-resolution images of the Siachen glacier show deep cracks every 10 feet, both in longitudinal and transverse directions. “The retreat of the glacier is also visible by horizontal expansion of glacial lakes throughout the glacier, but the most alarming sign is the vertical thinning of glaciers, which is aggravating the widening of crevasses on a massive scale,” the letter mentions. It is an established fact climate change is by far the biggest threat ever encountered by humankind. Glaciers are the most sensitive indicators of climate change. The Siachen glacier and other Himalayan glaciers act as climate regulators and are also natural heads of rivers that flow down to half of humanity. Arshad H Abbasi mentioned in the letter that he had brought to the notice of additional secretary and the then adviser, MOWP in September 2009, that the geo-thermal exploration in Siachen by India has been started. This entry was posted in News and tagged Defence, drilling, energy, geothermal, India, Pakistan, Siachen. Bookmark the permalink.